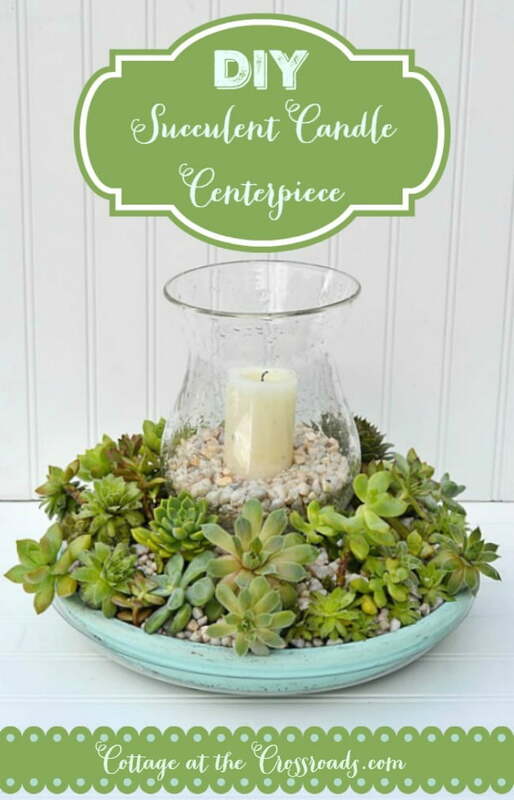 Today I’m sharing this succulent candle centerpiece that I made a couple of years ago. It’s a perfect project for bringing a little green and light into your home during these winter months, and will easily transfer to your outdoor living spaces when it warms up again. 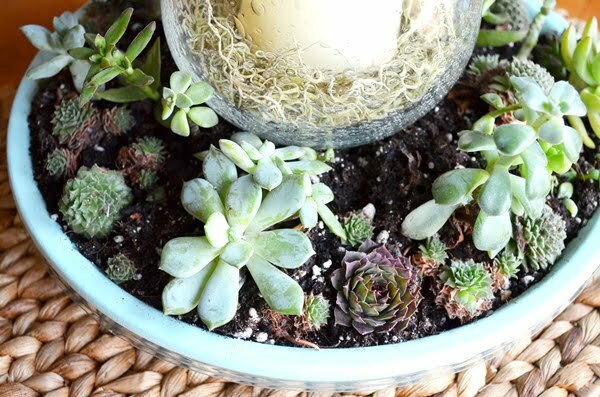 To make this project, you will need a variety of small succulents. I got lucky and found these on sale at Lowe’s. And I also had some growing in a planter that needed to be transplanted. See the little “babies” in there? If you can find someone who already has some succulents growing, they will be glad to share some of those babies with you! 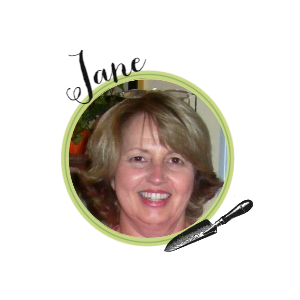 My sister-in-law Jean is always sharing some with me. 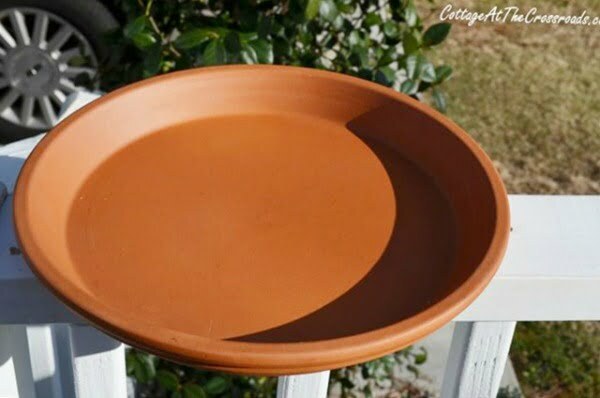 After you have gathered a variety of succulents, you will need a large terracotta saucer. The one I used had a diameter of 12 inches, and I promptly painted it aqua, one of my favorite colors. 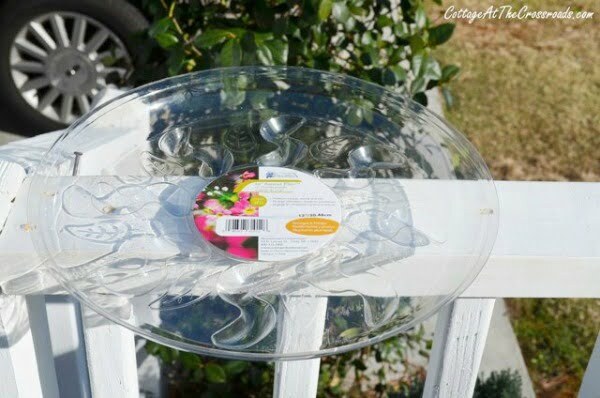 When I was purchasing my saucer, I picked up one of these plastic trays that has some little feet on it that goes underneath the saucer to protect the surface where ever you place your centerpiece. And you will need a glass candle holder. This is one I’ve had for years, and I tucked some green moss down inside. 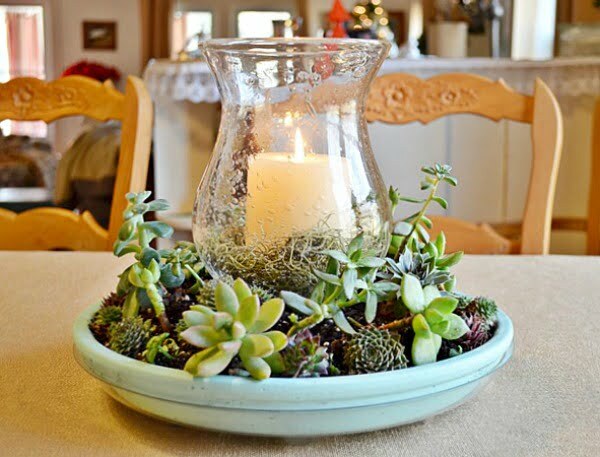 Place your glass candle holder on top of the terracotta saucer and then fill the rest of the space with soil. I’ve found that succulents really like this special soil because it drains and dries out easily. The next step is to plant your succulents. You can see how the aqua saucer picks up the pretty color of some of the succulents. 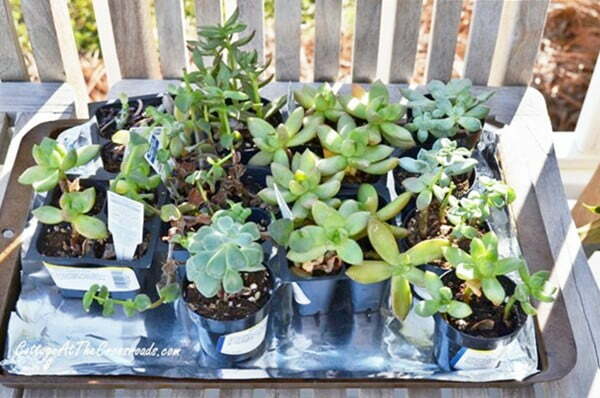 Try to mix the variety, size, and colors of your succulents as you are planting. 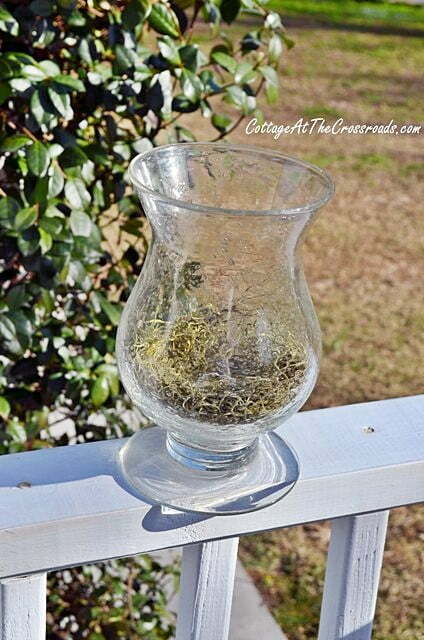 Very gently, water your succulents and then tuck a candle into the holder. During the winter, it makes a pretty, living centerpiece on your table. The clear, plastic tray underneath it protects your table from any moisture that it produces. However, remove it from the table whenever you water it. 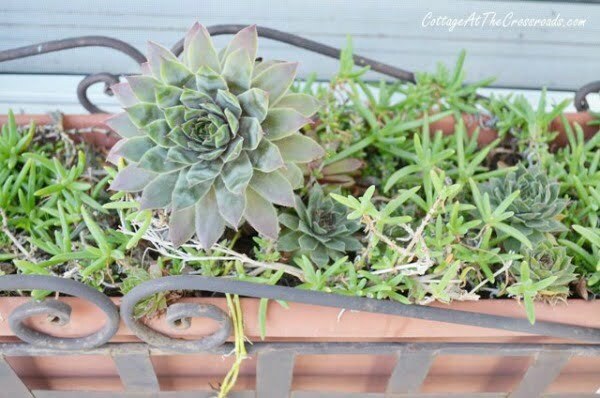 Contrary to what a lot of people think, succulents do need to be watered, especially when they are exposed to dry air. 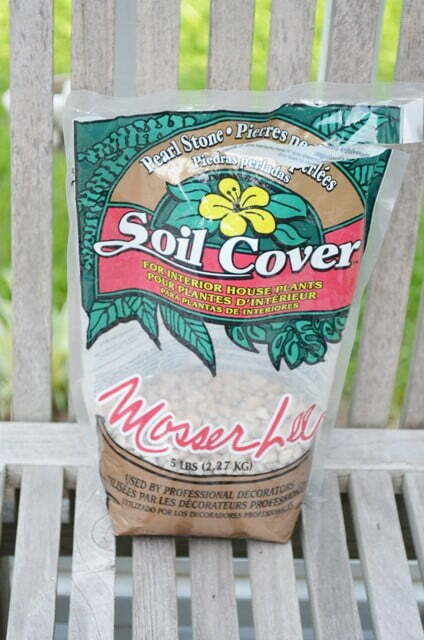 The soil needs to be moist but not soggy! Look how much the succulents grew within six months! You can see that I added some pebbles on top of the soil and down inside the candle holder, and I think that I added and/or replaced a few of the succulents when I was freshening up the centerpiece. I used part of a small bag of these soil cover pebbles, which I think gives the centerpiece a little more polished look. Beside, who really wants to see dirt when they are eating? I used the succulent candle centerpiece for almost a year, but as the succulents grew, they got transplanted into larger pots. I think I’m going to start another one soon! Jean, do you have any more of those babies to spare? 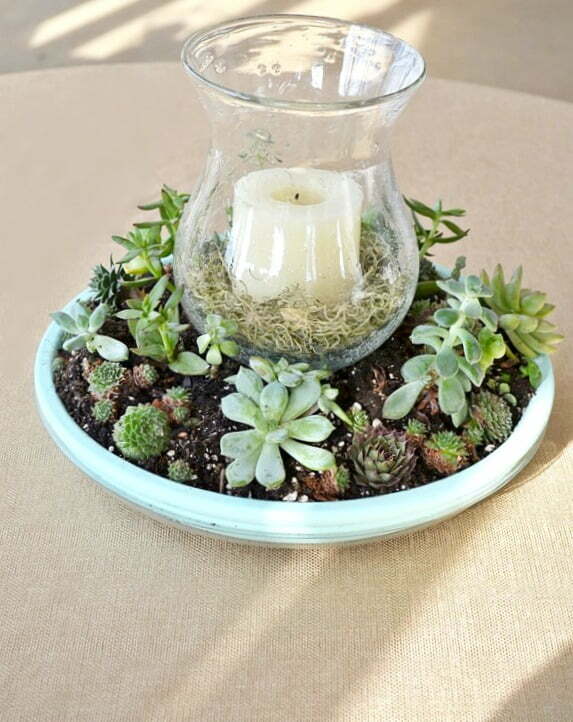 Love this succulent/candle centerpiece. I just started growing succulents this past June so I will be putting one of these together soon also. Thanks for sharing with instructions. I would love to see more of your projects please share some more with us. 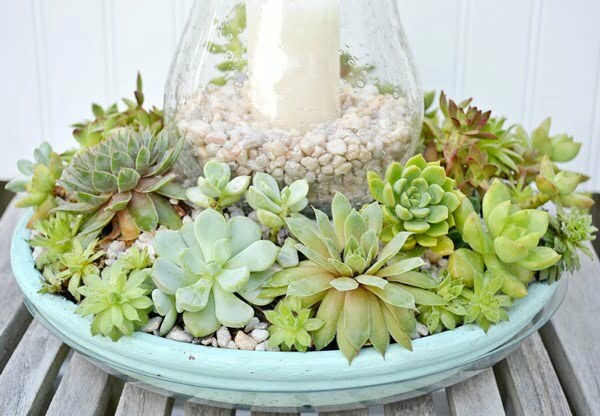 I just love this succulent garden I love he saucer idea I have some of the plants around my home & saucer, I’m looking forward to making mine &I hope it will turn out as pretty as yours thank you for the idea keep them coming. Love this! I’ve never tried to grow succulents, however this has inspired me! Thanks for sharing and giving such great instructions. Such a great idea, very pretty. I have been looking for something to put on my table for winter. Thank you for posting. Hi there! I love your project ❤️ But i cant seem to grow suculents i dont knw what im doing wrong. I live in New England so mostly cold. All my suculents die ☹️. I tried indoor and outdoor during summee time but still not successful. Need advice. Thanks! Both underwatering and overwatering could be the problem so you have to keep your eye on them. Some of them can tolerate the cold and others cannot so when you try growing some again, be sure to note the kind of succulent you’re buying so that you can research the conditions that they need for growing. Very creative! Just wondering why you didn’t glue down the glass candle holder? When you move the centerpiece indoors to outdoors, doesn’t the glass candle holder tilt or wobble or fall? And is this arrangement heavy? The centerpiece is not heavy at all so it can be easily moved and because my candle holder has a foot as a base keeps it from moving around. If the candle holder you select to use doesn’t have one, then gluing it down with waterproof glue would be a good idea. What kind of paint did you use? Does it matter? Stephanie, I think I used some acrylic paint that I had left over from another project. It lasted a long time even though the saucer got damp from watering. Eventually, it did start peeling so it may be a good idea to seal the terracotta saucer before painting it. I love this!! I love succulents & already have several with babies that need repotted, so this will be great for that. Thank you!! Any special type of paint? Mary, I think I used some acrylic paint that I had left over from another project. It lasted a long time even though the saucer got damp from watering. Eventually, it did start peeling so it may be a good idea to seal the terracotta saucer before painting it. Que bello arreglo con esas suculentas, ha quedado muy lindo para lucirlo en un centro de mesa, muchas gracias por compartir todos esos detalles con plantas y que alegran nuestra vida. One of the prettiest arrangements I’ve seen. I’m planning one for my patio table for the spring. Can’t wait! I have started on mine and wondering about drainage. I notice there is not a hole in bottom of terra cotta plate. 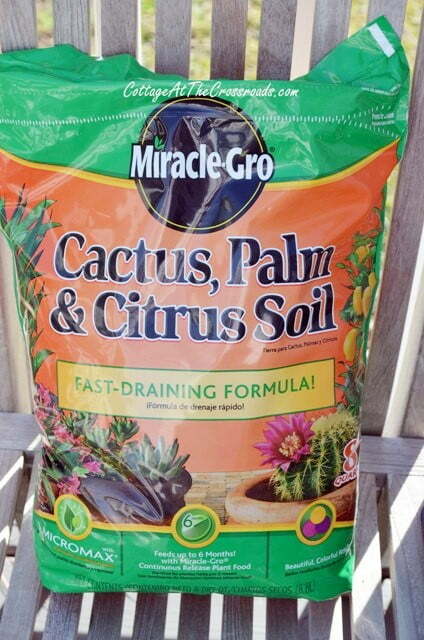 I read the succulents need good soil drainage. Marcie, just add a layer of those small pebbles in the bottom and that should take care of the drainage. Just be sure not to overwater your succulents, though. Very pretty! A friend is moving and asked me to help rescue the succulents that are growing in her flower bed at the old place, so I’ll have a chance to get some freebie babies! WOO HOO! We have just moved into a new home with a 3-season room and while Spring is trying to make itself known, this idea will make it Summery as quickly as I can get it done. It just so happens that I have a great resource for the ‘hens and chicks’ that I love. It will be gorgeous in the house with some miniature lights around the base of it next Winter. Thank you for the inspiration. 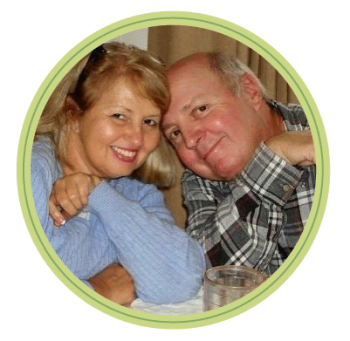 Enjoy your new home and your succulent centerpiece when you get it made! I have often thought that those tiny fairy lights would look good tucked down inside the glass candle holder. You could even camouflage them with green moss! This is gorgeous! I’m making one (or two!) Besides enjoying it myself, this would make a great gift for someone’s birthday or even a wedding gift! You came up with a real winner! Yes, they make great gifts. I gave one to my sister-in-law and she loves it. They would be perfect co-worker holiday gifts, too, as they are budget friendly! Love it! Very attractive and would make a beautiful birthday gift. I am going to make one of these to give away at a Relay for Life fundraiser! It came out beautiful, thanks for sharing. This is beautiful and I am making it soon. Got more great ideas. Would love to see them all. January duldroms …. and the home looks ’empty’ after all the bright and colourful Christmas decorations. I think this little project will give my home a lovely bit of colour – and see me through until spring! 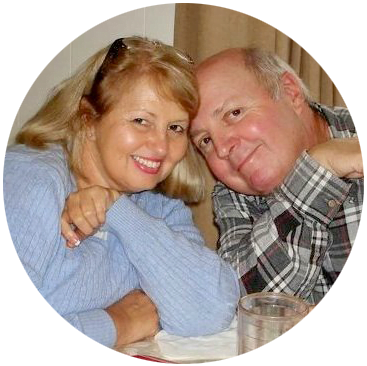 Thanks for sharing …. lovely idea! Hi. I really like this I have 2 already in the lounge but they do grow quickly in the home so by summer it will be moved outside so I will start with another one for inside keep them coming. Thanks. Beautiful succulent planter. I would love to make one. Just one question though. How much sunlight do the succulents require? Hi Pam, that’s a great question. 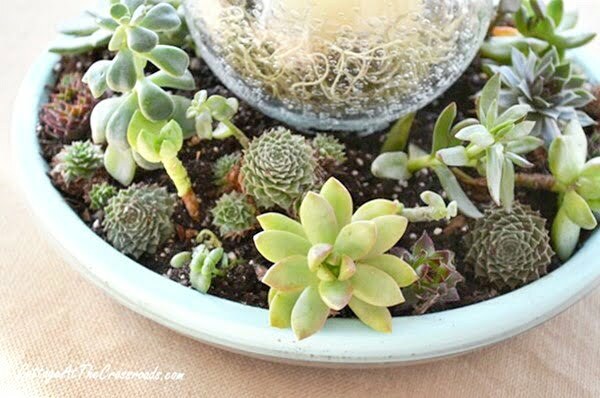 Succulents do need sunlight so keep the centerpiece near a sunny window when you’re not using it as a centerpiece. I put mine on our enclosed back porch where there are several windows and the temperatures are not freezing. Beautiful Jane, I didn’t know you could add soil to succulents. All i’ve ever planted them in is pea stone. Good to know and lucky you to have someone who will divide and give to you! I just love this. I am going to Lowes right now and start my project. If I can’t find the items there , the hunt is on! Great idea!!! Love this to add a little garden to my snow covered world.